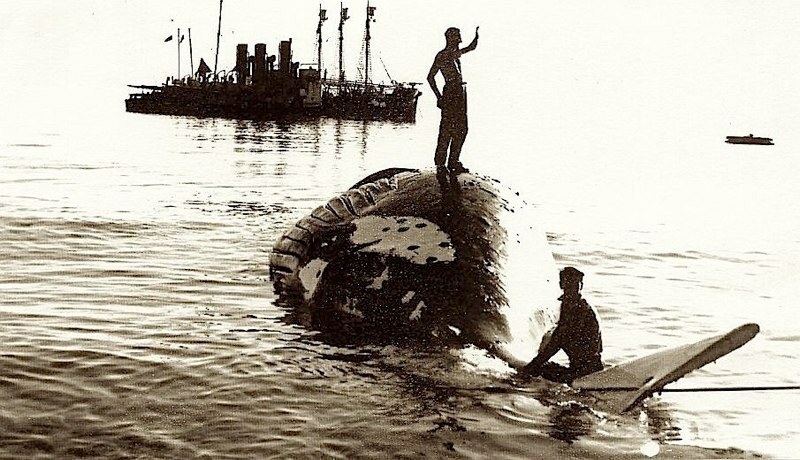 After WWII a huge demand for whale oil triggered a world-wide interest in whale hunting. To help satisfy this demand, a whaling station was opened at Tangalooma in 1952. The Tangalooma whaling station had an annual quota of 600 Humpback whales. However, when vegetable oils were introduced to replace whale oil in margarine production, the price of the whale oil fell dramatically. 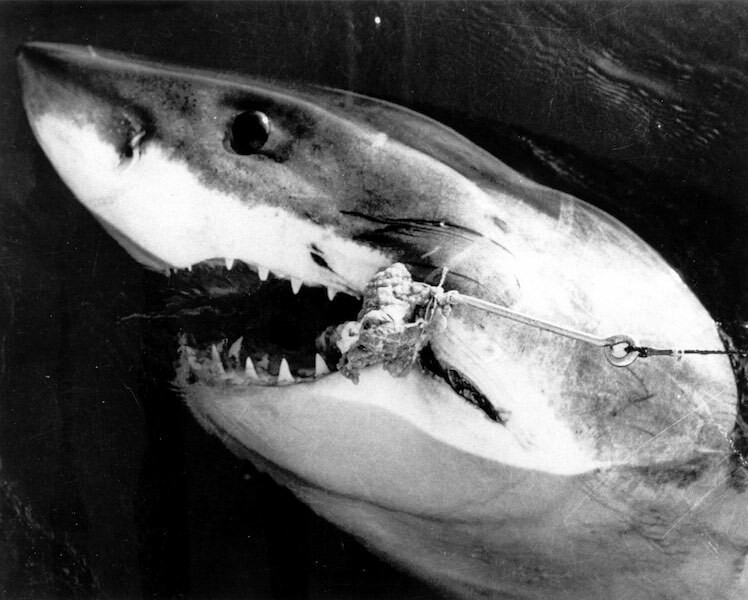 Quotas were increased to 660 to offset the price drop but the increased cull served only to deplete the whale numbers to such an extent that in the 1962 season, only 68 whales were taken, and in August of that year Tangalooma closed down due to a lack of whales. Jack Little:‘White Pointers were first attracted into Moreton Bay after the opening of the whaling station at Tangalooma on Moreton Island in 1951. They would follow the chasers back into the bay, feeding off their haul of whale carcasses. Peter Ludlow: While enjoying our morning coffee at the Lighthouse Restaurant on Cleveland Point this week, we were excited to see two whales breeching in the bay about a kilometre north of Peel Island. Then on the news yesterday we saw that two whales – a mother and her calf – were stranded in the shallows off Dunwich. It ended well for the pair, which surely must have been the ones we saw a couple of days earlier. The National Parks people say that whales come into the bay to rest on their long journey south. Incidentally, a university acquaintance, when mentioning how good it was that whale numbers were increasing, was told by an American colleague that this was a bad sign. Global warming is changing our ocean currents and forcing the creatures closer to shore. I wonder if this is why we have greater shark numbers inshore too? 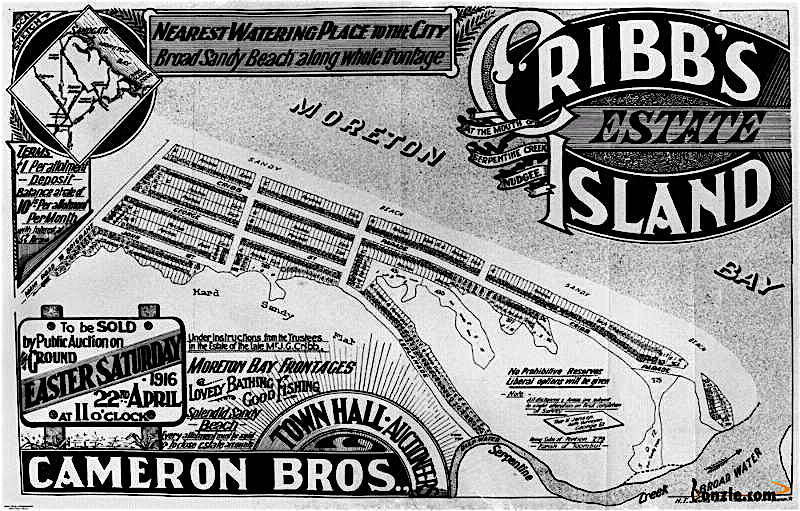 ‘I attended the Cribb Island School from 1924 to 1927. The teachers were “Hoffie” Hoffman and “Spud” Murphy. It was built out on the marsh and at high tide we walked up to our knees in water to get there. In 1927, there was great excitement when solo flyer, Bert Hinkler, flew over Cribb Island in his monoplane. This was also the year that Kingsford Smith also flew over in his “Southern Cross”. ‘At that time we lived on the Jackson’s estate. There was a shop and a dance hall, both owned by a man called Burgess. There was no police station, so if required, Policeman Long had to ride a horse from Nundah Police Station. There were about 150 houses on the Jackson’s Estate then and they were available for rental at 5/- a week. A lot were empty. There were also about 150 houses up the top end of Cribb Island. The Slade’s who ran the buses lived there, and also the Leo’s. ‘Personalities at Cribb Island included the brothers, Eric and Mick Leo, fisherman who rowed 14 foot dinghies. My brother, Ricky, used to help them. They netted at Shark’s Gutter at the mouth of the Brisbane River at Sambo Creek (named after an Aborigine) and at Bishop Island (then called Wreck Island because of all the hulks placed there to prevent erosion from ships’ wakes). ‘Sharks were in abundance and included Grey Nurse, but not Bull Sharks as you have suggested. One shark that comes to mind was known as “Big Ben”. He used to follow the vessel “Olivene” that took workers between Woody Point and Shorncliffe Pier. He was partial to scraps of food that were thrown overboard to him. A ₤5 ($10) reward was offered to anyone who could catch him, and eventually somebody did. 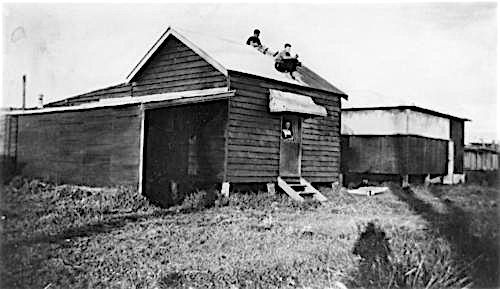 ‘During the 1950s, while the Tangalooma Whaling Station was in operation, a whale oil slick came right from Tangalooma into Nudgee Beach, a suburb next to Cribb Island. We used to watch the sharks fins going up and down the channel, just beyond the beach. I remember that a boy was taken at Cabbage Tree Creek near the boat ramp. There’s a deep hole there. It was late in the evening and he was being piggy backed across the Creek to Diners Island. I am not sure of the date but it may have been just before WWII. Incidentally, it was on Diners Island that some prison escapees hid out for some days before their recapture. ‘I visited Cribb Island only once. It was on a weekend drive with some friends during the 1960s when, out of curiosity, we thought we’d pay the place a visit. Although I didn’t have a camera with me at the time, a single mental image of the place has remained with me over the years. Cannery Row springs to mind to describe the collection of houses. The weathered wooden workers houses fronting the Bay were a far cry from the Bayside mansions we are becoming accustomed to seeing today. Storm clouds were brewing over the water and on the verandah of one of the shacks the motionless figure of an old woman was gazing out to sea. She watched our car trundle past and I had the strange impression that we were intruding on the lives of this isolated community.